The actress Helene Weigel was a respected theater actress who established herself in the lead role in the play "Mutter Courage und ihre Kinder". Film acting always played a secondary role in her career. 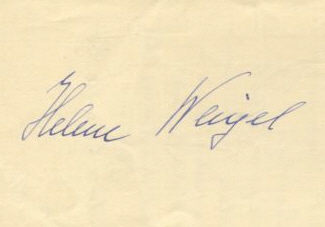 Helene Weigel had artistic training from 1915 to 1918 and was given her first theater engagements in 1918, such as at the Neues Theater Frankfurt, the Staatliches Schauspielhaus Berlin and the Deutsches Theater Berlin. She met the writer Bertolt Brecht at the beginning of the 20s, and their first child was born in 1924. They were married in 1929. Helene Weigel was the inspiration for many of Bertold Brecht's literary women and she portrayed them impressively on stage. Helene Weigel appeared in Fritz Lang's legendary silent movie "Metropolis" in 1927, in which she portrayed a female worker in. However, the theater was still hub of her life. One of her greatest successes was Brecht's "Die Mutter" in 1932.
the couple emigrated with their children to Switzerland; after that they went via Scandinavia to the USA. Helene Weigel had a minor role in the movie "The Seventh Cross" in 1944. She returned to Europe after the war and initially settled in Switzerland. In 1948 she went back to Germany where she founded the Berliner Ensemble in East Berlin together with Bertolt Brecht. She was director of this ensemble till her death. Carrar" ('53), "Mutter Courage und ihre Kinder" ('55) and "Die Windrose" ('57).